I've got a few artworks on show in Wellington at Mark Hutchins Gallery, as part of his Maquette exhibition. Here's a link to the works in the show. 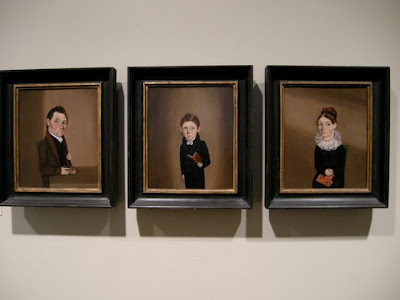 Three portraits of the Bonham Family, 1825 by William Bonnell (1804-65) Oil on panel. Coll. of Chicago Institute. Possibly a reference point for the enlarged heads of American Pop Surrealism? 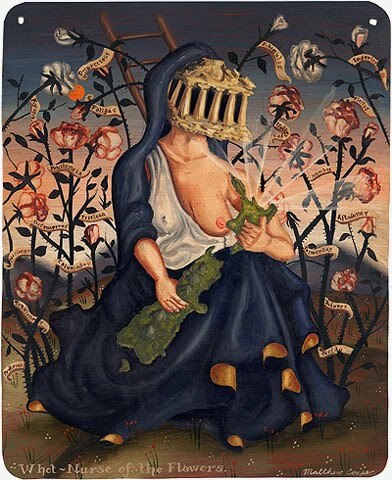 Recently, I've been talking to Wellington artist Liam Barr. I guess his work could be put into the Pop Surrealism category, with Martk Ryden as the most well-known proponent of the movement. 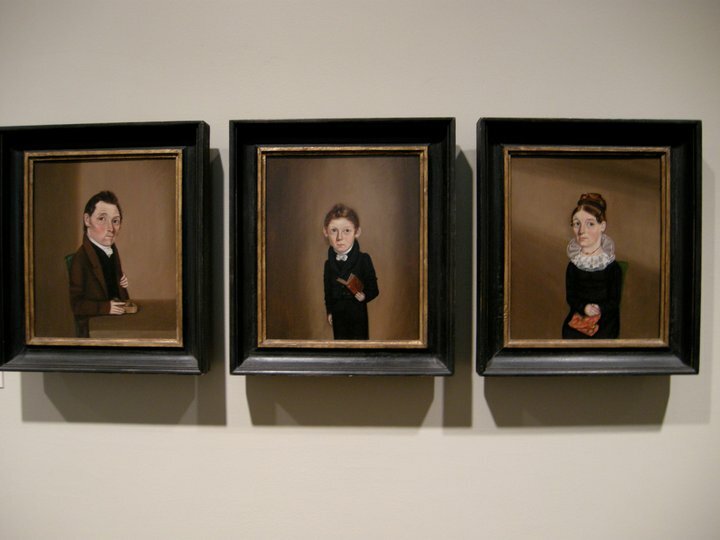 These works popped into my head for their head to body scale as a possible influence on Ryden. This photo was taken during our trip to Chicago in 2008. 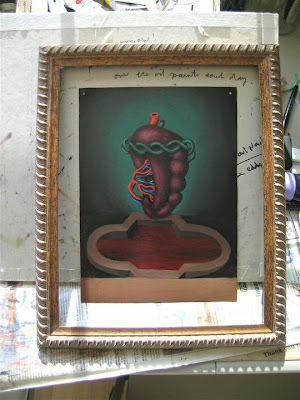 A new retablo started today. I've been struggling a bit in the studio lately, so I needed to vent out a bit. A Facebook conversation with Pauline from 'Art And My Life' blog ( see links to the right) made a statement about neurosis and venting and I thought that was a great starting point. There's still more to go to finish it, but subtle little additions so as to not distract from the initial impact that it's a sacred spleen rather than a sacred heart. I picked up the old frame from a Savers store here in Las Vegas, I've been having good fortune scoring lovely antique frames around the city. 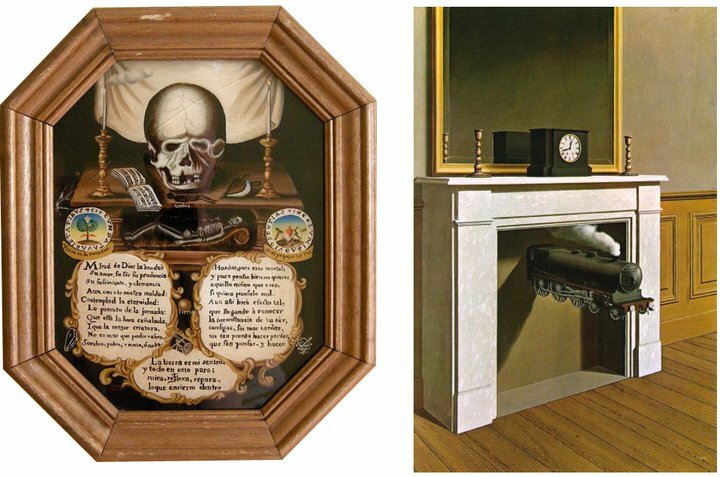 An interesting comparison I found as I was thinking about the Magritte painting in the right. The work on the left is a reverse glass painting in our collection. While watching a very good DVD on Magritte that started off by tracing his de Chirico's impression on him, there were animations of some of his paintings. The one on the right had candles melting in the holders, which instatly reminded me of the work on the left. Also the mantlepiece, the train as a mortality symbol (do you think?) and the mirror as the skull, which was always designed as a way for the viewer to confront their mortality.